This weekend, the World Spa Awards were presented in the Maldives. The 10 000 m2 Alpine Spa was voted “World’s Best New Hotel Spa”. This is already the sixth international award for the Alpine Spa this year. The Alpine Spa towers 500 meters above Lake Lucerne and is part of the Bürgenstock Resort. 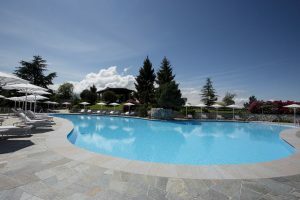 It is not only the unique view of the lake, mountains and the Central Plateau, which is praised by international publications such as Condé Nast, Tatler and Robb Report, but also the convincing architecture and the diversity of the spa. On 10 000 m2, guests will find a spacious sauna area, Kneipp pools, various steam baths, relaxation areas, private spa suites, a separate spa area for women only, an indoor and outdoor pool and the world-famous Infinity Edge Pool. “The sixth international award this year for the Alpine Spa shows me that we anticipated the well-being trend ten years ago when conceptualizing the Bürgenstock Resort,” says Bruno H. Schöpfer, Managing Director of the Bürgenstock Selection. «The Alpine Spa and the Waldhotel Spa are attractive wellness products that draw hotel guests and day spa visitors to the Bürgenstock Resort. The international praise for the Alpine Spa shows that we are able to offer our guests a spa experience at the highest level », says General Manager Robert P. Herr about the award” World’s Best New Hotel Spa “.